Slower episode tonight, with only one zombie kill (a fat, water-logged and nasty one) and mostly focusing on character development. After last week, Shane is still running his web of lies around Otis' death, and seeming to slowly stabilize. That is what happens after a traumatic event--eventually, things normalize. I think Otis will come back to haunt Shane in the near future, though. Meanwhile, Sophia is still missing. Darryl is, for whatever reason, the most dedicated member of the group when it comes to searching for her--he can relate to her experience and is probably also looking to finding her as a redemptive experience for whatever bad stuff he's done in the past. Darryl is my favorite character on the show right now and I hope he stays alive and stays good. We will see what happens if and when his now-one armed brother Merl re-appears. A couple major events on the show - Glenn/Maggie and Lori figuring out she's preggers. The Glenn and Maggie thing was awkward/funny and fulfills on the nerdy single guy fantasy of being "the last man on earth" with an otherwise unattainable gal. Though Maggie brushed it off as a one time thing, I predict she'll warm up to Glenn's charm as the season progresses. Lori's pregnancy raises a lot of questions -- who is the father? In the show timeline, Rick hasn't been back for very long. When will she tell Rick and Shane? I'm pretty sure Rick was already told by Dr. Jenners at the CDC - his whispered secret to Rick as they left. 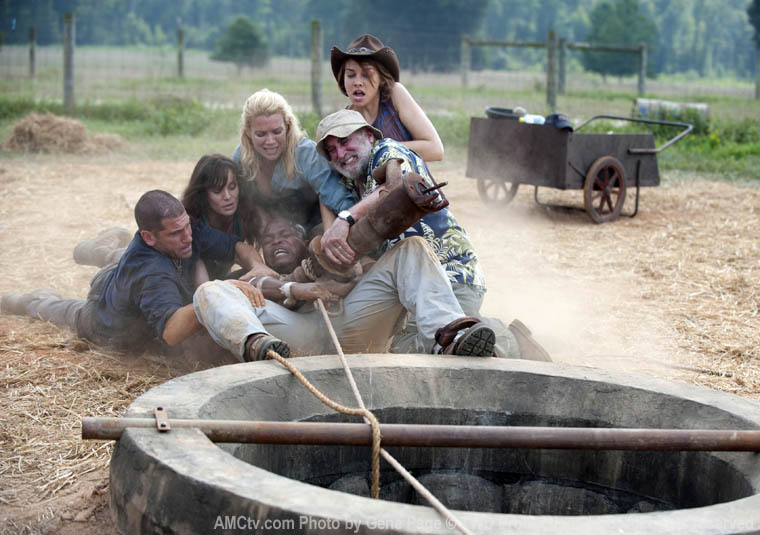 If Lori carries the baby to term, how will they survive with a crying infant? Any post-apocalypse world would be tough to bring a baby into, but the chances of surviving with a screaming infant out on the zombie infest road are next to nil. I do have to say that I hope that the show's direction continues to vary from the comic's. No spoilers here, but the story arc after the group leaves Herschel's farm gets into pretty dark/disturbing territory - especially the end. The show has been successful in using the comic as a jumping off point, leaving out lots of junk and adding in new/better material. I expect they will continue down that path. I think we're all growing attached to the entire group after these several episodes, and I don't want to see them brutally killed off without good reason. What did you guys think? Are they ever going to find Sophia? How valuable do you think pregnancy tests could become in a post-apocalypse world? What is going to happen when Merl shows back up? Any other ideas on how to get the "floater" zombie out of the well?